As Julie's companion at the show, I have to enthusiastically second everything she said. I thought I knew the Sondheim canon, the Sondheim anecdotes; I had seen plenty of mix-and-match Sondheim revues over the years. How could this have anything new to offer? By being Just That Good, that's how. One thing it ought to accomplish, if there's any justice, is to position Tom Wopat and Vanessa Williams in people's minds as absolutely A-list musical/dramatic artists. Yes, Art-ists. Despite the track record they've both accumulated, I have a feeling that people still think of him as "That Dukes of Hazzard guy who gets cast in a tour or revival when they could use a TV name" and of her as "that former Miss America who people will put up with as a song stylist because she's pretty." And they're both just sensationally good. And, as Julie said, they have the gift of simplicity; they know (as Barbara Cook and the others do too) that you don't have to ostentatiously "do things" with a song to make it unforgettable; if it and your interpretive insight are good, just sitting and singing it in perfect stillness will say everything that needs to be said. Now I'm getting all emotional again. Thanks for the wonderful writeup, Julie. I'm so glad we got to see it. 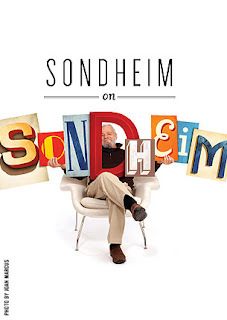 It is just a magical show for anyone interested in Sondheim. We better get a cast recording of this show, that's all I have to say. Oh, and the placement of the "ever" is actually making sense to me in that song for the first time. Go figure! Sounds SUBLIME indeed. "Not a Day Goes By" is one of my favorite songs ever. Here's a link to a preview video that shows some representative bits, including how the video works, and a stretch of the SUBLIME Williams-Cook duet (it has your song, Kathleen). I just got my Fall 2010 issue of THE SONDHEIM REVIEW, and in their coverage of "Sondheim on Sondheim," they print snippets of various reviews. Almost no one liked this show! What, are they on Mars?? Either it improved a lot between Press Night and when we saw it, or these critics are out of their minds. I say this with full knowledge that I have long been a critic and it's not polite of me to call others insane. But in this case... I'm just right!